Adam Kisielewski grew up in Kenosha, Wisconsin. Following the 9/11 attacks, Adam expedited his high school graduation and joined the US Marine Corps in early 2002. After completing his training, he was stationed in Washington D.C., where he provided security for the Commandant of the Marine Corps, the Chief of Naval Operations and other senior officers. During this time, Adam was hand selected to serve on the presidential security detail at Camp David where he protected the 43rd President of the United States, the first family and other visiting dignitaries. After completing his tour at the presidential retreat, Adam rejoined the infantry and was assigned to 2nd Battalion, 2nd Marines. In 2005, he deployed to Iraq as an infantry squad leader. Just over a month into his deployment, Adam was severely injured by an improvised explosive device (IED) while breaching a door in a building known for hostile encounters. Adam’s wounds required the amputation of his left arm and his right leg. His left leg was also badly damaged in the blast and required several months of continuous surgeries. After 14 months of recovery, Adam retired from the Marines as a Sergeant. 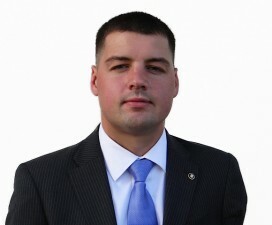 For the first 3 years following his military retirement, Adam worked as a contractor for the Department of Defense managing Congressionally funded projects. He also spent much of his free time volunteering with nonprofit organizations. In 2010, Adam left his contracting position to work full-time as a nonprofit executive. Adam has a bachelor’s degree from Mount St. Mary’s University where he graduated with highest honors. He is currently pursuing a master’s degree from Georgetown University and will graduate later this year. Adam is an avid supporter of the organizations that helped him and his family during his recovery. He proudly serves on the Board of Directors for Homes For Our Troops and is a pilot and ambassador for the Veterans Airlift Command. He also sits on the advisory board for Able Flight. In his free time, Adam enjoys riding his custom-built Harley Davidson with the Battlefield Chapter of the Nam Knights Motorcycle Club. He also enjoys aviation, outdoor activities and traveling. He lives in Maryland with his wife Carrie and son Evan.